When I was a kid, I had a great Cheshire Cat mug that changed color when you poured hot liquid into it. More specifically, everything but the cat’s big grin disappeared when it was full. At the time, my drink of choice was hot chocolate. I wouldn’t turn down hot chocolate today, but a mocha would probably be more my style. I still have a soft spot for those color changing mugs, though, and this Tank Up Coffee Mug. The mug has a fuel gauge printed on the side that turns bright red as you fill up the cup. 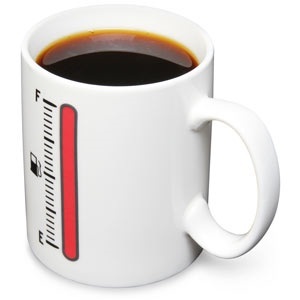 The gauge will only go up halfway for a half-full mug, but let’s face it: with coffee, as with gasoline, it’s better to fill that tank up when you have the chance!